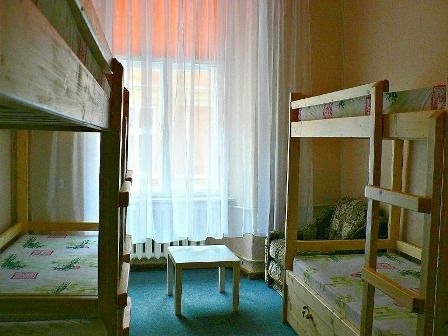 You won't find a better place to rest your head in Lviv than our hostel! We promise a pleasant, friendly atmosphere with all the comfort and cleanliness of home.We have three rooms (4-, 6- and 10-bed dorms) with excellent new beds. Rooms are cleaned every day. There's two bathrooms so there's hardly ever a queue, plus we have around-the-clock hot water.Rates include breakfast, tea and coffee, plus clean towels. Our kitchen has a fridge, microwave and all the necessary utensils so you can cook a nice meal. There's cable TV, 24hr reception, and a laundry service.Surrounding our hostel you can find Market Square, the Armenian Church, City Hall, Opera House, Boim Chapel and many interesting cafes and restaurants. We can recommend the best places to get Ukranian coffee and local dishes!We can organise excursions, provide info on local festivals, fairs, parties and celebrations, and organise delivery of meals and transfer from the airport, train station and bus station. Stay with us, and we will make your trip to Lviv an unforgettable one. Since we're in the very heart of the city, everyone knows where 13 Virmens'ka Street is, so if you get lost just ask someone!From the airport:Take trolley bus number 9 to Ivano Franko University. Go around the building from the left side, walk to the end of the Sichovyh Striltsiv Str. and make a right. You will walk into Lviv's main avenue, Prospect Svobody with Taras Shevchenko Monument. There you will see a watchtower with a flag - that is the hallmark of Plosha Rynok, Lviv's central square. Or you can take bus number 95 to Prospect Svobody with Taras Shevchenko Monument. Alternatively, take a taxi which should cost approximately 40 to 50 UAH.From the railway station:Take trams number 1 or 9 to Plosha Rynok Square.From the main bus station:Take 'Marshootka' (Small Bus for 2.00 UAH) number 71 to the center. Simply print our map and indicate our location to the driver or ask for 'Shevchenko Monument' which is on the main boulevard called 'Prospect Svobody'. There you will see a watchtower with a flag - that is the hallmark of Plosha Rynok, Lviv's central square.Taxi from the train station are approximately 30 UAH and from the bus station 40 UAH. Negotiate the price prior to departure.